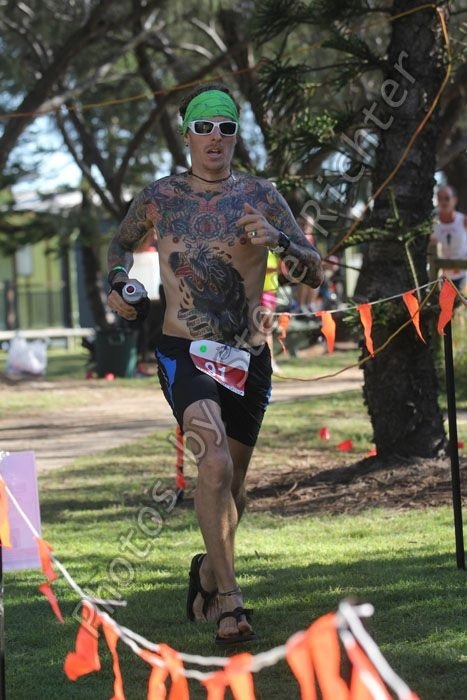 TattooRunner: The old dog still has a few tricks! The old dog still has a few tricks! 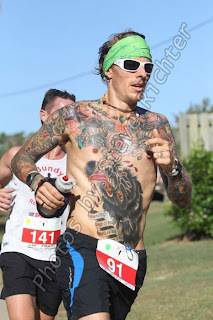 Well, it seems a bit odd...an ultra runner writing a race report for a 6k event, but hay, don't be hatin, you just might enjoy it! Yesterday was Anzac Day...for those overseas who don't know, it is when we Australians and New Zealanders remember our fallen and current soldiers who have served for our respective countries Bundy Road Runners put on a annual running event in memorial, and this year it was at Elliot Heads. The race didn't start until 8:20am so dad and I decided to run down to the start line from my house. It was a 21km trip and the weather was beautiful! A magic day and the running was so easy! We had a great little cruise down together and enjoyed the morning. Once we had arrived, dad took off with mum back to town for the big service in the main street. I grabbed my number, talked some rott and enjoyed a bit of sunshine. Before starting a few mates and I decided 30min would be a good time, not hectic fast, just a nice hit out to enjoy the morning. The course was three laps of a 2k course with a decent little hill and a run around the Anzac Memorial park by the beach which was fitting. So, before long, we were off. WHAT THE HECK! I think I had a rocket and must have done the first two k's in well under four minute pace! I had hit my lactic threshold! This ultra boy aint done speed work for as long as I can remember and haven't run fast fast for even longer! I needed to settle into a pace a bit slower but still maintain consistency otherwise someone would have been scraping my tattooed corpse off the footpath! As the race progressed I passed a number of guys and girls who must have gone out bit quick! I also had the 'hill legs' to pass crew on those sections too. I kept at it, hurting a bit but loving the morning and the different kind of racing. Before long I was done and super surprised to see 26:14min on the clock! I can not remember when I ran that fast! I was stuffed but recovered quickly for a chat and a bit of socializing before heading home to study. Slow is the new fast Keph! It was super nice to do something different and have a ripper morning out in the sun! I won't be changing over to shorter events anytime soon but variety is the spice of life right?! I just want to thank Sherry and Keph for continuing to do awesome things with Bundy Road Runners. Your efforts and hard work I know are appreciated by all! A great morning out! This morning I was a bit worried after running hard in the race...however, I managed a 17k at 5:16 pace so the fitness is improving, as is the recovery rate. My weight is coming down and things are going super good on the Engine 2 diet (wholegrain, low fat vegan diet). GOLD! So there you have it! This old boy has still got a bit of speed and now looking forward to Cooks Tour in three weeks! Next week will be a bit of a down week as I am getting my feet tattooed on Sunday, so hopefully that bit of rest will do me good and freshen me up for the weeks ahead! Have fun all and run free, plant strong!!! Look out road runner.. meep meep! Wild Horse ripper Easter Day!